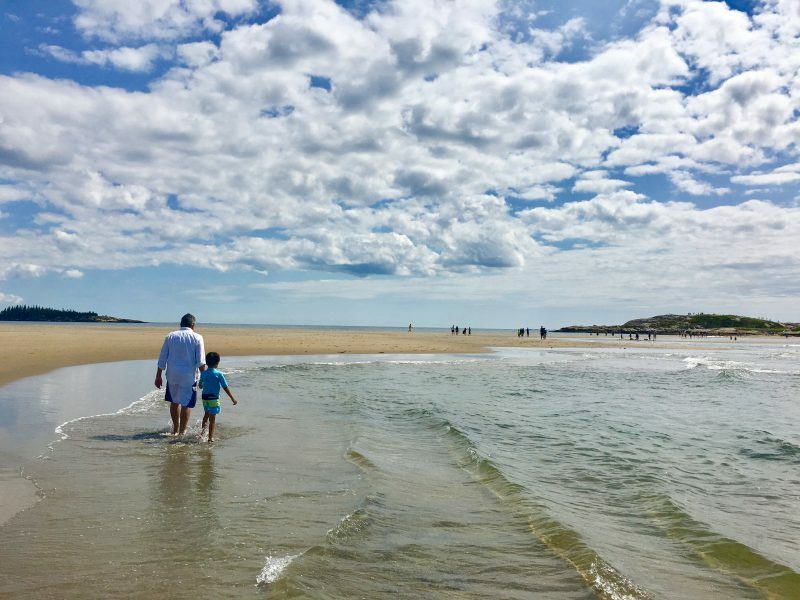 Deep harbors, scenic lighthouses, lobsters, blueberries, rocky coastlines, and thick forests come to mind when one thinks of Maine in summer. If you go by satellite images, its jagged coastline stretches to 5500 miles, if we include all the islands. Conveniently located farther northeast than any other state in U.S., the state of Maine covers nearly as many square miles as the other five New England States combined. Initially a part of Massachusetts, Maine officially gained statehood in 1820. I have always visited Maine during the warmer months, although all it takes is a gust of wind for us to wrap our cover-ups a little tighter. And if the sun decides to go behind a giant cloud, out come the jackets. The water feels chilly in August, even as the warm sand feels glorious under our feet. A trip during the icy winter months is one worth thinking about, even as I haven’t yet unpacked from our beaches and lobsters getaway. Did you know that Stephen King wrote his first novel, Carrie, while working as a teacher in Bangor, Maine? It’s hard to write about Maine without a mention of one of its most famous natives who has based many of his horror stories in the state. 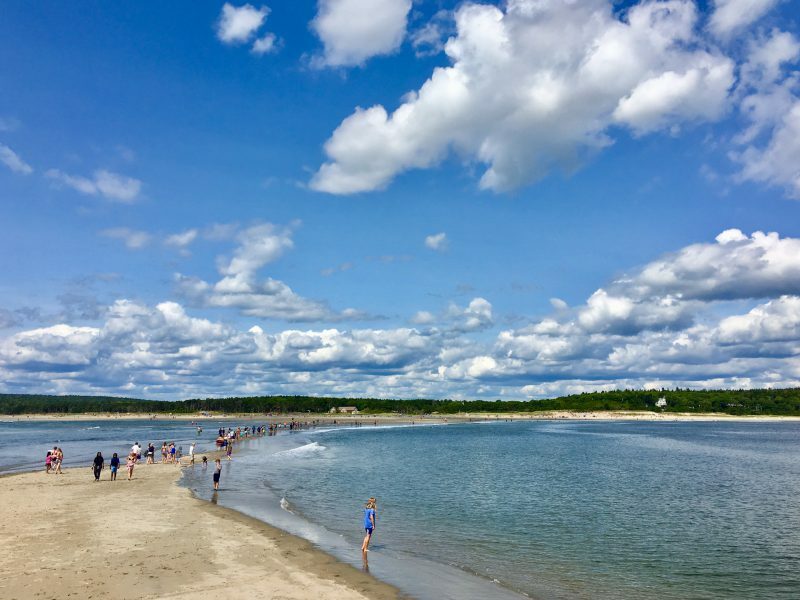 On day one, we drove to Popham Beach on Maine Route 209, in Phippsburg. It’s a long stretch of sand beach that undergoes extreme change in shoreline and frequent dune erosion. It’s the marked effect of such beach dynamics that has led to Popham being called a rare geological landform. Visitors are advised to stay on the trails and avoid all vegetated areas. We timed our arrival during low tide and walked all the way to Fox Island. As with Silver Sands Beach, be careful not to get stuck on the island as the water can rise swiftly during high tide. Undertows and occasional rip tides are not uncommon in this area. The park has fresh-water solar rinse-off showers and clean bathhouses, plus being spread over 500 acres gives it the distinct advantage of seeming sparsely populated, even on busy summer weekends. The Kennebec and Morse rivers border each end of the beach, and if you ask me, pictures can’t do justice to its pristine beauty. As with all Maine shores, the craggy rocks add a much-needed edginess to the bland allure of the blue and green. After spending the better part of the day in Popham, we drove to nearby Spinney’s for dinner. If you are in the area, check out Fort Popham, a Civil War-era defense structure which found its place in the National Register of Historic Places in 1969. Spinney’s Oceanfront Restaurant lets you know that its not a fast-food place so do not expect your food to arrive immediately. A local fixture for quite some years, it’s the waterside location that draws people to Spinney’s. Five year olds are rarely partial to seafood, so my husband and I tried their lobster, which by the way, was not always the delicacy that it is today. Found in abundance and called “cockroaches of the sea” by the colonists, lobsters were used as fertilizers and fish bait, and routinely fed to prisoners and servants. But then something happened. The railways started to expand all over America, and trashy old lobster began to be repackaged and served as a rare, exotic dish. Inland passengers lived in their inland bubble and had no idea that lobster was considered coastal peasant food. They loved it, demanded it, and by the 1950s, the rebranding of lobster from yuck to yum was complete. And of course, in keeping with the basic law of economics, as demand increased, so did the price. Speaking of seafood shacks, we also checked out Percy’s, another local establishment with even lesser frills than Spinney’s and a great view. It’s a convenience store and seafood place rolled into one. Although they tried, it seemed like they were ill-prepared to handle food allergies. As for Spinney’s, as you can see from the picture, they could have eased up on the fries. Initially a fan of the whole lobster, this time around we stuck to the buttery rolls. If you are in the area sans kids, and with plenty of time to combat the long wait on the sidewalk along U.S. Route 1, do check out Red’s Eats. 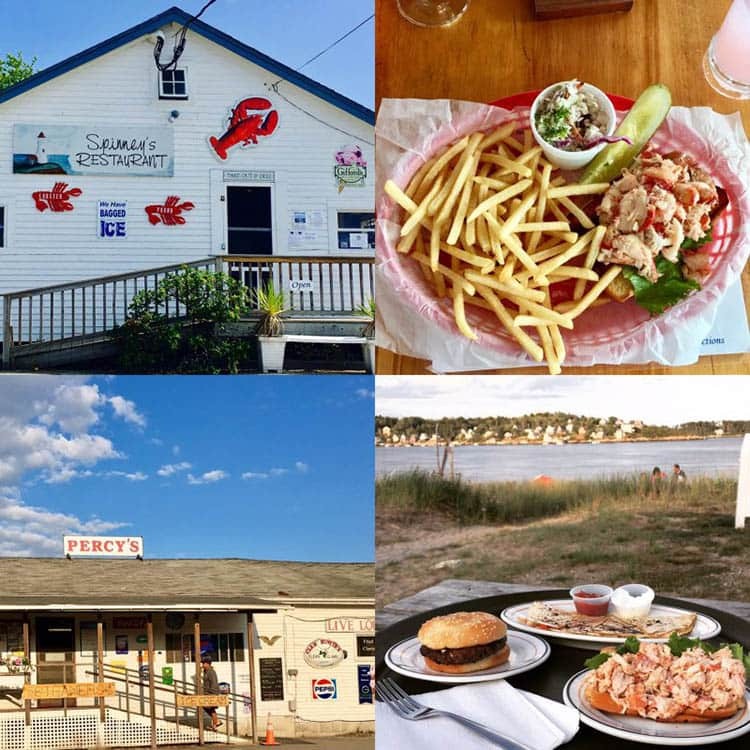 It’s located at the end of the Donald E. Davey Bridge in Wiscasset, and its lobster rolls are legendary. When you go deep into Maine, away from the crowds and tall buildings, the sky seems to open up and the air turns fresher and saltier. For a while, you wish you lived there. People who actually live there may feel otherwise. That’s not surprising, is it? As they say, the grass is always greener on the other side.